Painting by Hérine Fourie I am always grateful for more information on authors, especially those who are marked (*) in the author's list. In January 2010, I received a lively portrait of the famous scientist Pierre C Haarhoff by John Talbot and additional information by Jasper Steyn and Gerrie Zaaiman. Dave Hughes contributed the text to Sally Simson's page. This is a "thank you" to Stellenbosch and our friends here - and to the friends who lured us here. Cathy and John Horan, an American couple we first met in Vienna, told us: "If you are looking for a place to settle, do have a look at South Africa." They introduced us to Marie and Johan Viljoen (then the South African consul in Vienna), who encouraged us to move to Stellenbosch. Well, we did so in December 1981 and never looked back! After many years living in different countries we finally settled down here, where our sons grew up, attended local schools and studied at the University of Stellenbosch. One of the first books we were given was: STELLENBOSSE GALERY, published by HAUM in 1974. Our thanks go first to the compilers of this booklet. It has inspired us to read some great works by Stellenbosch authors and has also inspired me to publish a follow up, a new Stellenbosch Writers Gallery. 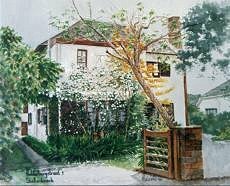 To find the necessary information, I created this website: www.StellenboschWriters.com, and many kind people from all over the world have contacted me with suggestions and hints. Pieta van Beek, Andries Cilliers, Japie Coetzee, Elisabeth Dostal, Gwen Fagan, Hérine Fourie, Mikael Grut, Essi Honiball, Mhlobo Jadezweni, Johannes Jordaan, Hester Joubert, Deon Knobel, Laetitia Knox-Davies, Walter & Colleen Köppe, Gerrit Kruger, Willem Malherbe, Hannes Meiring, Geraldine Mitton, Lizette Rabe, Marius le Roux, Jan Sadie, Lina Spies, John Struthers, Francois Verster, Gideon Visagie, Philip de Vos and the Gerricke Library. I am most grateful to all authors who sent me personal information and gave permission to use their photographs, illustrations and excerpts from their work. (If I have inadvertently infringed a copyright, please contact me) Ters van Huyssteen granted permission to use excerpts from his books. Jill Adams and Hérine Fourie very kindly let me copy some paintings from their books: Richard Liversidge, The Birds around us and Stellenbosch, respectively. Ted Oliver sent us photos of Ericas, Bob Warren of Gladioli and Jim Holmes of indigenous bulb flowers. Willem Malherbe contributed photographs and Hannes Meiring paintings of Stellenbosch buildings. Philip de Vos gave permission to use his photographs of authors, Bertie du Plessis made available his drawings and Eddie van Dijk sent me photos of frogs. Hanna Botha, John Kannemeyer, Gerrit Kruger, Hennie Rossouw, Lina Spies, Christo Viljoen, Herman Wasserman, Dorothea van Zyl and many others helped with good advice and information. Many - including Anne Labuschagne, Kees Graswinckel, Hennie Aucamp, Roger Beck, Hubertus von Bergmann, Amanda Botha, Vincent Brummer, Jo-Marie Claassen, Johann H Claassen, Hans Knap, Cornelia de Kock, Johann de Lange, Marius Louw, Willem Malherbe, Floris van der Merwe, Anton van Niekerk, Louw van Niekerk, Rik Nulens, Reino Ottermann, Lina Spies, Liza van Staden, Arno van der Valk, François Verster and Johann Webb - supplied me with photos, texts or material on authors pages. There are too many to mention them all! Pierre Morgenrood deserves an extra thank you for his collaboration over many weeks on many authors. The help of Stellenbosch University and other universities is much appreciated. US allowed me to use photos of their website. J.C. Kannemeyer, Geskiedenis van die Afrikaanse Literatuur and André Brink, Groot Verseboek 2000 and the CD Rom Verswêreld, all published at Tafelberg. H.P. van Coller (editor), Perspektief en profiel, 'n Afrikaanse Literatuurgeskiedenis, J.L. van Schaik Uitgewers G. F. C. de Bruyn, Professore: Universiteit van Stellenbosch en voorgangers. I made full use of publishers' webpages, especially from Human & Rousseau and Tafelberg and I thank them also for their advice, help and the photos! Literature e-magazines have been very useful, especially Litnet and Boekwurm. Thank you, Etienne van Heerden for help and kind words of encouragement. Thank you too, Eikestadnuus, Die Burger, Insig, Litnet, Boekwurm and Kakkerlak for publishing our announcements. I like to include quotes (found at Verba Volant) on the home page, and Dirk Laurie is very kindly translating them into Afrikaans. Ted Taylor and Steve Mills offered generous help with proof-reading my texts. Amanda Botha helped me launch the book, Stellenbosch Writers, in March 2005. Finally thank you, Hans, for taking care of technical matters and for putting up with my newest fanatical hobby. www.Atomz.com is providing a free indexing service that makes searching this website possible.